It’s been a while since I posted a resource page, so here are my articles on RPO as well as other resources I have found on the internet. I’m always looking to share more. Email grabkj@gmail.com or use the comments section to post other links. 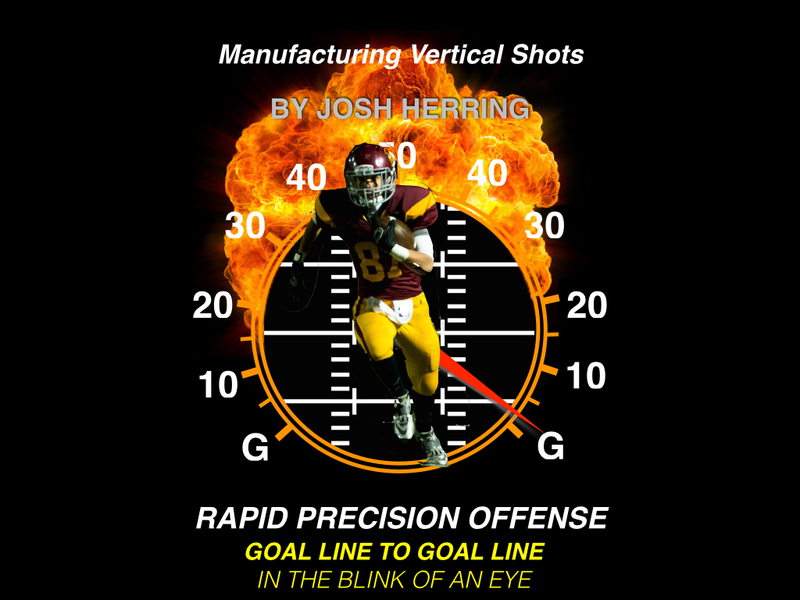 Manufacturing Vertical Shots by Josh Herring is the second volume in his series: Rapid Precision Offense. Herring’s first volume Quick Rhythm Option Routes is an outstanding coaching resource for any offense. He includes ways to include the routes into many concepts from multiple formations. He also illustrates using quick option routes packaged with runs to create run-pass options. Through his works Josh Herring has shown he is a bright football mind. Check out his first iBook. It will definitely have you excited to see the new one. Both volumes include over 2 1/2 hours of video. Like all Coaches Edge products it is full of the details you need to implement the concept now. Through text, 68 diagrams, 20 instructional videos, and 72 game video cut-ups, Herring gives all the details necessary to install the quick rhythm option passing game. These concepts can fit into any offensive system and enhance receiver abilities. With the details provided, these concepts can be added to a system to create a high percentage passing game with explosive opportunities. Video totals over 2 hours and 30 minutes. I am excited about what Coach Herring has produced with Coaches Edge Technologies. This is something every offensive coordinator needs to see. These high percentage, yet explosive routes can be implemented into any offense. With over 2.5 hours of instructional video and play analysis, Herring gives you the details you need to implement these concepts. Included in the “Further Review” section are over 70 cut-ups which can be viewed in regular speed and slow forward/reverse as well. Below is the Foreword by Dan Gonzalez. Here’s what Dan has to say about Quick Rhythm Option Routes by Josh Herring. I met Josh several years ago, as we shared our viewpoint on the passing game. I immediately sensed that he was truly a student of the game – not just concerned with the “X’s and O’s” of football plays, but with the individual details that make these plays come to life. With that common ground, we struck up a friendship, and have exchanged ideas ever since. I can honestly say that Coach Herring is my favorite kind of coach – one who strives for continuous improvement, rather than resting on the laurels of one or two or three or five good statistical seasons. He’s dedicated to his craft, and is always improving his methods of teaching. So, when Keith Grabowski asked me about potential authors for iBooks, Josh was at the very top of the list. Quick Rhythm Option Routes represents a very pertinent, essential topic for coaches at all levels. With the exception of the highest levels of college football, most teams only have one or two true receiving threats. Further, few teams have a sure fire breakaway threat. Coach Herring illustrates for us, in great detail, how a team cannot only survive but thrive in the passing game under such circumstances. Not only does this work cover the basic option routes that are perhaps covered on the clinic circuit, but provides the basis for an entire series from which to base a passing game. The technical detail and video illustration that accompany the text and diagrams are second to none; the reader will feel like a participant in one of Josh’s quarterback meetings. With over two hours of video, not to mention the raw video footage provided as a reference tool, coaches will be armed with everything they need to not only implement into their system, but troubleshoot coaching points and counter defensive tactics as well. Oftentimes, clinic attendees are left to their own devices as they install; not so with this work. No longer can a coach simply throw their hands up and say “we can’t get open” – no matter what level of talent, a competent player should be able to gain leverage to receive a pass. In other words, a 4.8 receiver can beat a 4.4 Division 1 linebacker prospect by getting on his inside or outside shoulder and getting a well-timed pass. Over and over again, Josh explains (and actually shows us) how to make this happen for the offense. Quick Rhythm Option Routes is the first in what I hope to be many works from Josh Herring; he is an outstanding coach and we can all learn from him, regardless of one’s level of play. Josh Herring recently completed his 5th year as Offensive Coordinator and QB Coach at Lassiter High School in Marietta, Georgia. Known for their wide-open up-tempo offense, the Trojans have set numerous individual and team offensive records during his tenure. Competing in the state’s largest classification, they reached the semi-finals in 2011 and won consecutive region championships in 2012 and 2013 with an undefeated regular season in 2012. His QBs have led the region, county, and state in passing and 5 different offensive players have made All-State or Honorable Mention All-State teams, with a number going on to play collegiately, including in BCS conferences such as the SEC and ACC. Coach Herring began his coaching career at Colbert Heights High School in Tuscumbia, Alabama, and over the course of four seasons served in various positions including Offensive Coordinator, Quarterbacks Coach, Wide Receivers Coach, and Running Backs Coach. In 2007, his first year as offensive coordinator, the program achieved a school-record for wins and broke nearly every school offensive record. His QB at Colbert Heights finished his 4 year career as Alabama’s all-time completions leader, ranking in the top 10 nationally. He spent the next two seasons as Wide Receivers Coach and Passing Game Coordinator at Pelham High School in Pelham, Alabama. Coach Herring and his wife Ashley are both educators, and he teaches AP Government at Lassiter. Coach Eckley presents a topic that has become the hottest in football offense: the run-pass option. Beckley explains his use of RPO and its evolution in his system over a 15 year period. Eckley’s teams are 126-14 over his tenure, and RPO was a factor in their offensive success. Over 3 hours video include clinic explanations, video telestrations and analysis, and 43 game cut-ups from sideline and end zone views. Beckley’s explanation of his system from top to bottom allow any coach the understanding of RPO and how to include it in his own system. From Josh Herring’s interactive book Quick Rhythm Option Routes. The quick rhythm options routes explained in detail by Coach Herring make the passing game look simple. Herring shows how quick option routes can be incorporated into many passing game concepts as well as run-pass option. While addressing the use of RPO is only a small section of the book, the examples and tutorial provide a powerful application of the concept. Here is a section of the text followed by a preview of the tutorial video from Coach Herring. Coach Herring’s book includes over 2 1/2 hours of video and is a must have resource for any offense. His concepts can be utilized in a variety of systems. More and more teams are using run-pass combo plays as a part of their offense and we are no exception. In 2012 Run-Pass combos made up 15% of our play calls, in 2013 20%, and in 2014 14%. One family of combos in our offense that includes popular concepts such as Stick-Draw and Stick-Zone has the QB reading an inside linebacker for a pass/handoff read. By locking the backside tackle on the backside defensive end, we isolate the backside inside linebacker. If he drops to #3, we hand the ball off. If he plays run, the QB has the inside slot running Sloppy. 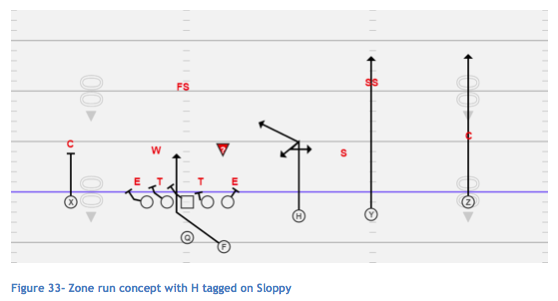 By tagging Sloppy in lieu of a Stick or Hitch, the slot has more freedom to win versus a variety of coverage looks and far more potential for an explosive play via the inside slant option. 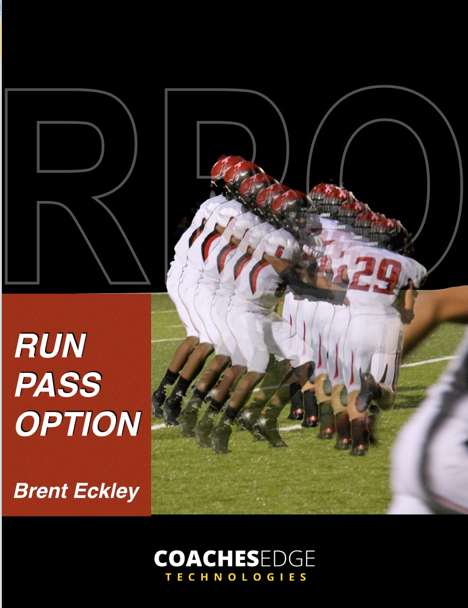 Coach Brent Beckley’s book dedicated to explaining run-pass options will be available later this week. Email grabkj@gmail.com with “RPO” in the subject line to enter a drawing for a free copy. Coach Eckley’s book will include over 3 hours of video. He gives a start to finish explanation of their system and how they have built in RPO.